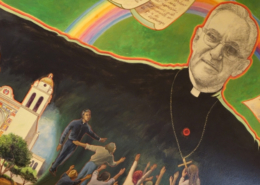 The canonization of Archbishop Oscar Romero on October 14, 2018, will bring to fruition a reality that the Salvadoran people have known for many years: Oscar Romero is a Christian martyr. 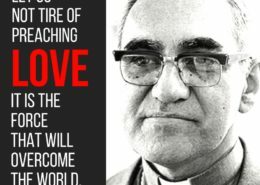 The recognition as “Saint” is a reminder of Romero’s love for Christ grounded in his solidarity with his brother and sister Salvadorans. 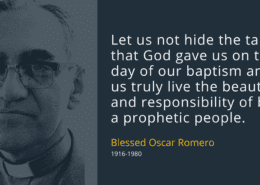 Romero’s witness has inspired millions of people to reflect on how they themselves are living out the Gospel as people of justice and peace. 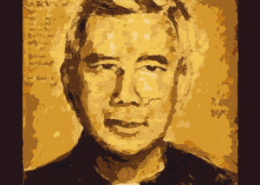 Romero Is Risen in the People: Where should his relics remain? 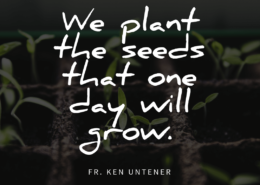 https://ignatiansolidarity.net/wp-content/uploads/2015/05/10920939_10100168550525581_1681718924198273688_n.jpg 640 640 Natalie Terry http://ignatiansolidarity.net/wp-content/uploads/2013/04/ISN_Color_Transparent_Large.png Natalie Terry2015-05-22 13:27:122017-07-11 10:34:37Romero Is Risen in the People: Where should his relics remain? 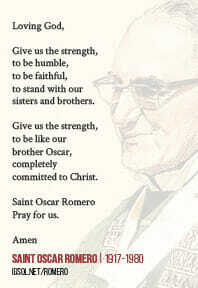 The Saint Oscar Romero prayer cards feature an image create by artist J. Puig Reixach and a prayer to Romero. 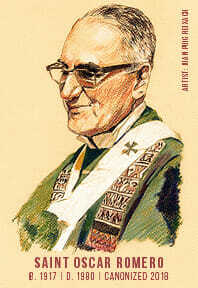 Cards are also available in Spanish. 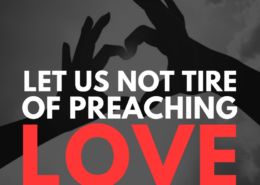 If you would like to order more than 1,000 prayer cards or would like prayer cards shipped outside of the continental U.S., please email info@ignatiansolidarity.net.